ItemI-52619 - "Marble River, site for storage and diversion dam at the middle canyon looking upstream; location drains into Quatsino Sound northwesterly end of Vancouver Island". ItemI-52620 - "Upper falls on the Nahmint River, which drains into the Alberni Canal, Vancouver Island, BC." ItemI-52621 - "Head of the upper falls on the Nahmint River, near Nahmint Lake; the river drains the northwest side of Barclay [Barkley] Sound to the Alberni Canal". ItemI-52622 - Canyon at the foot of the upper falls, Little Qualicum River, source of Cameron Lake, Vancouver Island. ItemI-52623 - "Foch Lake, showing outlet, elevation 1400 feet, location Foch Creek draining Foch Lake flows into Douglas Channel, south of Prince Rupert". ItemI-52624 - "Breaking camp, Downton's survey party on the Cariboo Wagon Road near Clinton". ItemI-52331 - "Gallagher Bluff and Lake, steel flume and rock sheds". ItemI-52332 - "A pretty location on the west lateral, corn intercrop between young trees"
ItemI-52333 - "The government buldings, Oliver; young Linden trees". Item I-52623 - "Foch Lake, showing outlet, elevation 1400 feet, location Foch Creek draining Foch Lake flows into Douglas Channel, south of Prince Rupert". 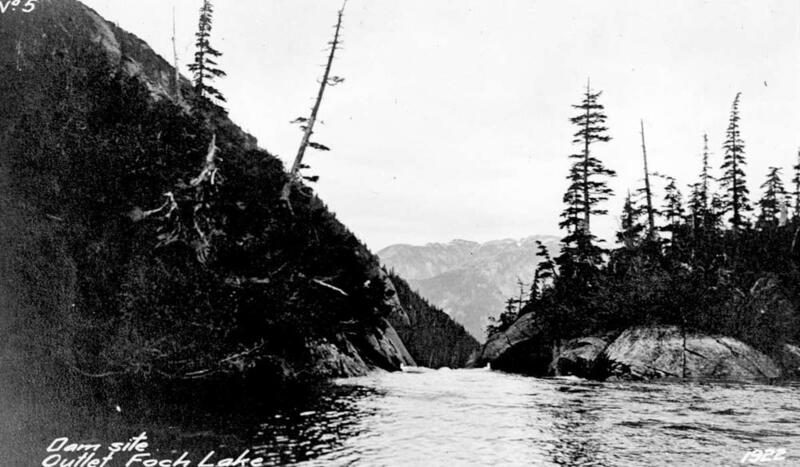 "Foch Lake, showing outlet, elevation 1400 feet, location Foch Creek draining Foch Lake flows into Douglas Channel, south of Prince Rupert".